President & Founder – George Robb, Jr.
First published in Royal, J. 2009. “Illyrian Coastal Exploration Program—The 2009 Campaign” In The INA Annual 2009:45-54. Fieldwork along the eastern Adriatic coast in 2009 marked the initial campaign conducted and coordinated under the research initiative of the Illyrian Coastal Exploration Program (ICEP). The goals of the program, introduced in this publication (Royal 2009), are to bring together numerous research institutes in an effort to investigate the eastern Adriatic coast. At the core of this program is a survey of the littoral region, out to the c. 100-m contour, spearheaded by RPM Nautical Foundation (RPMNF). The goal of the survey is to document all submerged cultural finds in an effort to assist the countries involved with the protection and scholarly research of these finds. This process is underway in Albania and Montenegro, and efforts are underway to organize fieldwork in Croatia for 2011. Among the entities involved in the program are the Albanian Ministry of Culture and Tourism, Albanian Institute of Archaeology (AIA), Butrint National Trust (BNT), Montenegro Ministry of Culture, Regional Center for Underwater De-Mining (RCUD), Montenegro Center for the Protection of Cultural Heritage (CPCH), Institute of Nautical Archaeology, Trinity University-San Antonio, U.S. Embassy-Montenegro. Efforts of many individuals make the program possible, among them are Dr. Adrian Anastasi (AIA), Co-Director in Albania, Auron Tare (BNT), Veselin Mijajlovic (RCUD), and Dr. Vilma Kovacevic (CPCH). 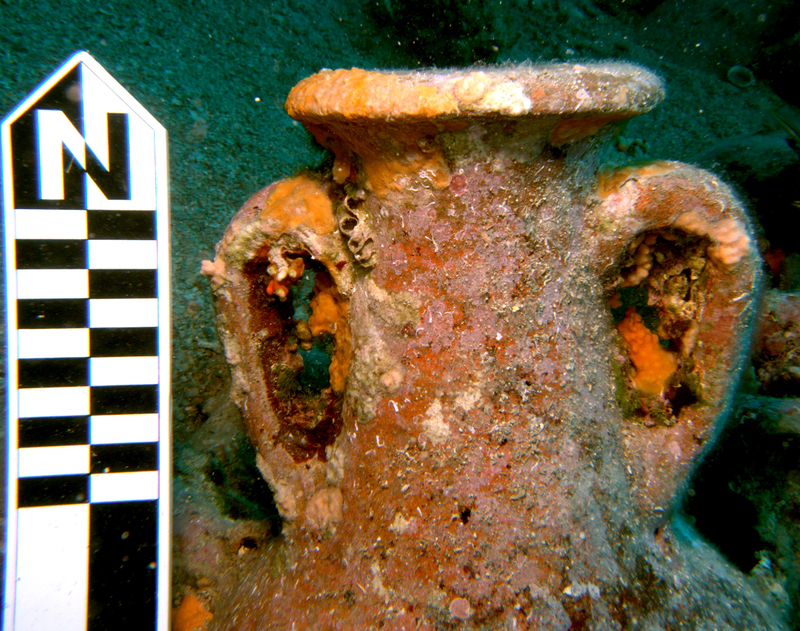 An African 3C amphora on the Joni wreck site. Photograph by D. Smith, RPMNF. Survey operations with a hull-mounted multibeam sonar were undertaken during May and June by RPMNF’s R/V Hercules. Detailed bathymetric data was collected first in Albania then continued in Montenegro. Overlapping survey lanes along the contours of the seafloor ensured 200% coverage of the seafloor and the ability to detect anomalies. Anomalies were verified primarily with a Remotely Operated Vehicle (ROV) operated from the R/V Hercules, except for a few in shallow areas of c. 5-35 m of depth where divers were utilized in Albania. Once the research vessel was positioned over an anomaly location, the ROV was deployed. A forward-scanning sonar affixed to the ROV facilitated the location of each anomaly and aided in the examination of the area surrounding each anomaly for scattered objects. Each site or submerged find was recorded with the ROV’s multiple video cameras. When deemed necessary, and conservation facilitates were available, objects were raised to assist in determining the date, provenience, and nature of the site or find. When geologic formations were encountered, they were scanned for cultural material that often is trapped when drag nets or currents push them onto rocks. In addition to the multibeam survey, diver investigation was conducted in selected near-shore areas of Albania in order to gain an understanding of the presence of shallow-water material cultural. The dive team was expanded during the 2009 field season with the participation of volunteers from numerous organizations. Diver investigation included sections of coast all along the survey area. No beacons were attached to divers during operations; however, the locations of the dive boat, buoys placed at the furthest extents of the survey, and buoys at finds were recorded. Divers were armed with amphora and drawing slates for recording finds. In Albania, the 2009 multibeam survey addressed gaps and unfinished areas within the section surveyed during the 2008 season, and subsequently continued northwards. From the southernmost point at the Greek border, the survey has progressed northward to Porto Palermo in three seasons, a distance along the coast of c. 50 km. Once the operation progressed north of Corfu (Greece), it was possible to extend the survey area further offshore out to the c. 80-100 m contour. The survey plan formulated for Montenegro for this inaugural season was based on the areas of interest of RCUD and CPCH representatives, particularly the bays of Kotor and Risan. Founded in the 5th century BCE, the city of Risan includes remains from the Illyrian and Roman eras as well as the medieval period. Additionally, the survey of the outer coastline began with the area directly opposite the entrance into Tivat Bay (Boka Kotorska) and extended Cape Mačka. Combined the surveyed areas of Kotor and Risan Bays was approximately 28 km2; the bays have a general depth of c. 30 m with a maximum of 60 m in spring holes. R/V Hercules approached very close to shore in some sections and also passed in depths as shallow as 12 m. The coverage area on the outer coast was c. 32.5 sq. 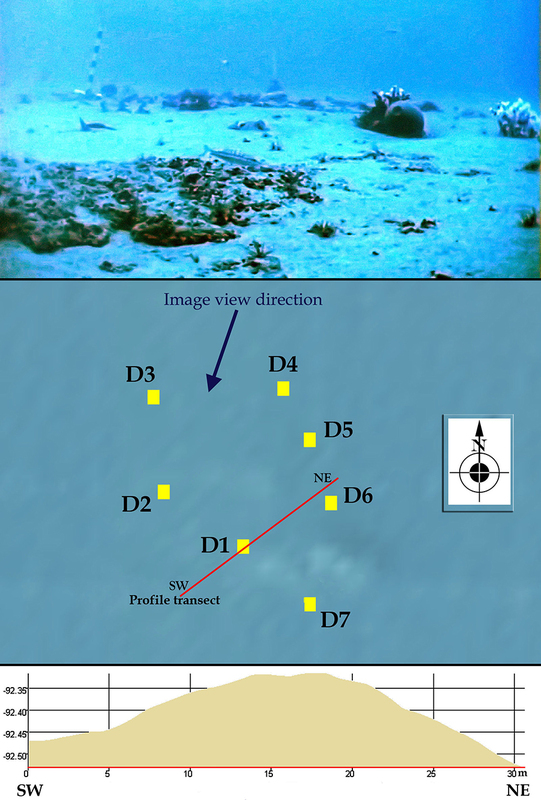 km and ranged from 17–100 m.
Images of the Boka Kotorska 1 wreck site. Courtesy RPMNF. Images of the Boka Kotorska 2 wreck site. Courtesy RPMNF. Data from the multibeam operations was processed during, and directly after, the collection phase to produce three-dimensional models of the seafloor, which was then analyzed for anomalies. Anomalies were examined for association with either geologic formations or deposits consistent with shipwreck sites, the latter were plotted for verification. Once mapped out in navigation and spatial recording software, the R/V Hercules navigated into position over anomalies and the ROV equipped with a transponder was deployed. The software also allowed the real-time tracking of the R/V Hercules and ROV within a three-dimensional seafloor model, and to obtain precise locations for sites and random finds. During verification operations, the locating of each anomaly, as well as stray material near anomalies and sites, was facilitated by a forward-scanning sonar affixed to the ROV. Once cultural material was located and positions recorded, a visual investigation ensued through the use of still and video cameras. Scale was provided with a laser affixed to the ROV that provides two 10-cm spaced points. After completing the processing of data acquired during 2009 in Albania, ands its collation with previous season’s, the areas north of Saranda around Cape Qefalit and extending northward possess a large number of rock formations in the deepest sectors of the survey area. Some formations near the cape form linear patterns extending tens of kilometers, while the formations further from shore are more heterogeneous in size and pattern. These rock formations do not appear within 5-6 km of shore N of Cape Qefalit, where they are apparently buried under sediment layers. Ascertaining the possibility of rapid and massive geologic modification of this area is beyond the scope of this report. However, once multibeam lanes were run in a roughly E-W direction (perpendicular to shore) just to the N of Cape Qefalit in order to adjoin the 2008 multibeam coverage, the surveyors noted that depths indicated on the current charts in use for this section of the Albanian coast were in error. Actual depths were much greater for the position on the chart; for example, areas recorded as c. 90 m of depth were actually 75-m deep. Hence, the area possible to survey is greatly extended from shore than was indicated during the planning phases of the field season based on chart data. This increased area requires a greater time commitment to complete; consequently the survey did not reach out to the 100-m contour in the Porto Palermo area. Coverage was completed to Porto Palermo out to the 40-50 m contour in order to allow room for vessel maneuvering and free the surveyors to plan the most efficient lanes for covering the area. This inconsistency between the depths indicated on the charts and the actual multibeam depths has two possible explanations: the charts are in error, or there has been a large amount of sedimentation in this area that has dramatically changed the seafloor topography. Other evidence that indicates discrepancies in the survey for charting purposes and ICEP data is for the large rock outcrop near shore (Gjergantas Bank) that extends to within c. 2 meters of the surface in several places. This obvious navigation hazard does not extend to shore as indicated on charts. Recent work along the Croatian coast indicates the eastern shore of the Adriatic is undergoing subduction at varying rates. Combined with the sea-level rise over the past several millennia, submerged Romanera structures indicate an overall rise in relative sea-level from 1–3 m. Given this difference in historical sea level, the Devil’s Tongue formation must have presented a particularly dangerous navigation hazard in antiquity. As noted above, the bays of Risan and Kotor were intensively surveyed to assess the potential for archaeological finds. A review of the data produced interesting results for understanding the nature of the seafloor. The bottom is at a consistent depth of c. 30 m, gradually decreases in depth at the towns of Risan and Kotor, and is composed of a soft, silt stratum on the surface. In the central portion of this bay system are numerous fresh-water springs fed from the surrounding mountains that rise to over 800 m. These springs maintain large craters formed in the seafloor with depths from 45–60 m, which demonstrate the vast amount of sediment deposited from the wash off the surrounding peaks. Tidal and circulatory currents as well as seasonal storm action move the sediment out of the bays to the coastal entrance where it dissipates southward down the coast. Three modern wreck sites were discovered during the 2009 field season, all of which are in the coastal section of Montenegro. A submarine (site MN09-AA) was partially buried in the silty bottom near the entrance of Boka Kotorska. This c. 30.5 x 7.0 m vessel has large sections of the outer plating missing, some of which appears torn away. There are at least two torpedo tubes along the NE side of the vessel, a large hatch or gun emplacement positioned along the vessel’s top at the NW end, and at the SE third is a likely coning tower. A review of the WWI and II-era submarines in the Maritime Museum in Kotor provided several good matches for dimensions and features. A second military craft (MN09-AB), measuring c. 39.0 x 7.5 m, was discovered just south of the previously discussed submarine. It sits upright with a large amount of structure visible, although the remaining height of the structure is not great. A narrow length-to-beam ratio and metal construction indicates a swift vessel of the early-mid 20th century; it has similarities to the torpedo boats known to have operated in this area. 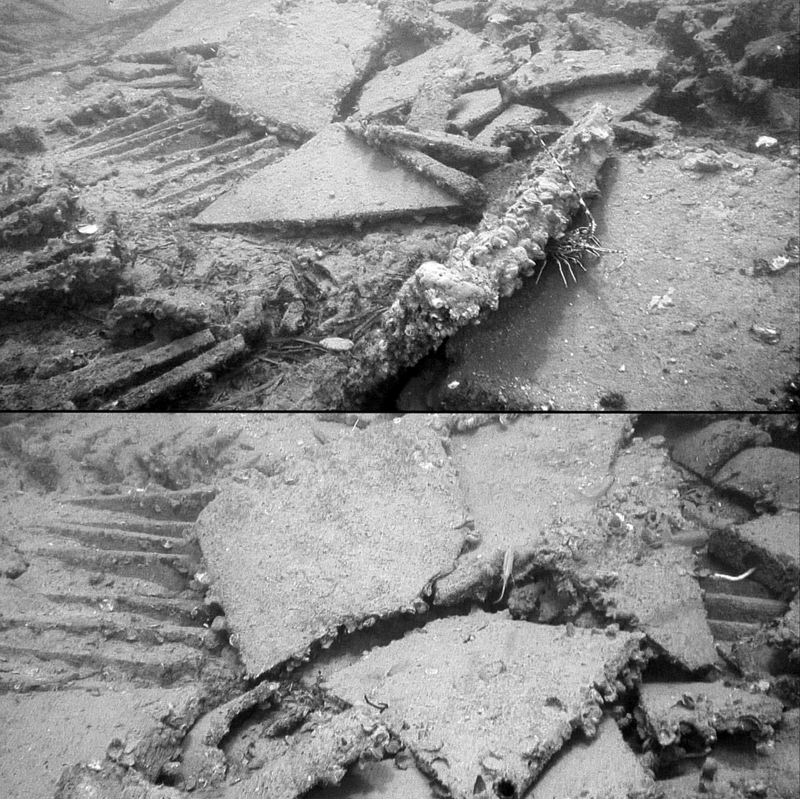 The final modern wreck site (MN09-AC) is also a modern war vessel located near the previous two, probably constructed of aluminum, and has a shape consistent with a fast patrol craft. There are apparent blast holes at the bow and stern of this c. 38.0 x 8.5 m vessel. The wreck sits nearly upright at the fore section but twists to its port in the a‑ft section where the bottom of the hull is visible. Poor visibility due to the sediment outflow from Boka Kotorska made identification difficult; yet it has many features of communistera patrol craft, many of which were of Chinese manufacture. Verification of multibeam anomalies produced three Roman-era wreck sites, one in Albania and two in Montenegro. Considering the natural hazard presented by the Gjergantas Bank along the Albanian coast between Cape Qefalit and Porto Palermo, anomalies were carefully explored. Divers were used whenever possible due to the obvious hazard for the R/V Hercules. Examination of an anomaly at c. 23 m of depth on the inner side of the rock formation produced a well articulated and largely undisturbed wreck site: the Joni wreck; site AB09-AA). The principal portion of the site, a c. 9 x 4.5 m oval, is formed by 3–4 layers of intact amphoras. Approximately 20 m down slope of this primary deposit is a fan of broken ceramics that runs c. 15.5 m in length. No artifacts were raised for analysis during the season as it was decided that proper conservation facilities were not available. However, the shallow depth and good visibility allowed excellent image documentation and in situ measurements. On initial examination, the cargo is primarily amphoras of type African 3A-C; however, there are also Late Roman 1 and 2 examples present as well. There is much variation in the rims within the three African 3 sub-type that often makes differentiation difficult; however, the intact examples provided additional identification traits such as the more slender bodies of the African 3C sub-type and the bulbous form on the base spikes of sub-type African 3A. The latter two types of Late Roman amphoras have an E Mediterranean origin and were present in the upper portion of the intact main deposit and the spill deposit, apparently loaded on top of the N African amphoras. As such, the preliminary assessment of the cargo origin is N Africa, probably Tunisian, with possible port calls along the western coast of Greece before it sank here in the 4th century CE. The Joni wreck is one of two found in this project that date to the Roman or late Roman era, both with N African cargos; a supposed Roman-era wreck located north of the Butrint River mouth located in the late 1990s is un-substantiated. A wreck discovered the previous season, site AB08-AH (Butrint 2 Wreck) carried Tripolitanian 1 type amphoras dated to the 1st–2nd centuries CE. One of the areas of inquiry raised by these two sites is the routes of goods moving from N Africa into the Adriatic. Routes from N Africa are traditionally believed to run along the S coast of Italy; however, these two Roman merchantmen point to another route through the straits of Corfu and, consequently, a more easterly initial route from the African coast. One of the two Roman-era finds found in Montenegro was a somewhat large wreck site, a c. 25.0 x 7.0 m primary deposit, which features a cargo of roof tiles. The site is located approximately one km from shore in the open seafloor, and has undergone impact from fishing activities as evidenced by the large fishing net snagged on the tiles. Both flat pan tiles (tegulae) and curved cover tiles (imbrici) were present on the Boka Kotorska 1 wreck (site MN09-AD), the former were much greater in number. Many of the tiles remain in a stacked position, shifted as the wreck settled and decayed, and are intact. At least three long rows of tiles are noted running along the site’s long axis. Lamboglia 2 amphora from the Boka Kotorska 2 wreck site. Photograph by J. Royal. A complete pan tile; (artifact number MN09-0001) and a cover tile were recovered for documentation. The tegula was c. 63 x 47 x 2.5 cm, comprised of a dark red fabric and possessed flanges oriented at 90o to the flat pan surface. Notches cut into the flange’s upper portion at the forward, and lower section of the rear, ends facilitated their overlapped stacking on roof tops. Both the tegula and imbrix were nearly iden‑tical to ones recovered during dive survey along the Corfu Strait in Albania during this same season. Such tiles are difficult to date on their own, although there are assuredly stamped tiles within the cargo that would facilitate dating; however, they are of the form common to the early Imperial period. 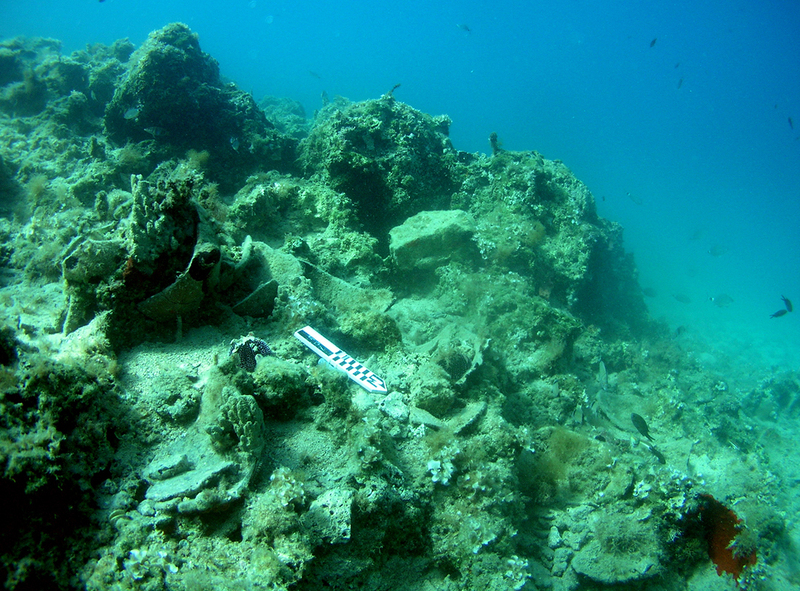 Similar tile wrecks are fairly common in the shallow waters investigated thus far in Croatia. Tile production was minimal in the eastern Adriatic during the 1st–2nd centuries CE, the initial organization period under Roman rule. During this period, tiles were shipped into eastern Adriatic port cities to supply building projects. By the end of the 2nd century CE onwards, the local production of tiles was developed and decreased overseas demand. Although it is impossible to determine the exact date and provenience at this time, the wreck was very possibly carrying tiles from workshops on Italy’s Adriatic coast operating during the early imperial period, a time when heightened imperial family and senatorial involvement in the industry is recorded. 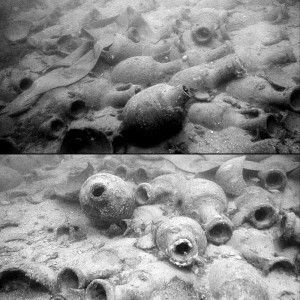 A second wreck (site MN09-AE) of the Roman era was located near the entrance at Boka Kotorska that carried a large shipment of amphoras. The Boka Kotorska 2 wreck site was somewhat spread out, 20 x 17 m, due to apparent hits by fisherman’s drag nets. The amphoras in the central portion of the site have fallen in an organized pattern from their stacking arrangement and are mostly intact; many are buried to a large degree. Those amhoras on the outer sections of the wreck are damaged with numerous sherds scattered around, their orientations are inconsistent, and often sitting more atop the sandy seafloor. It would seem that some of these amphoras were dislodged from a more organized deposit and damaged by drag nets. Based on the visible amphoras, the majority, if not all, of the cargo is of Lamboglia 2 amphoras that date from the early through end of the 1st century CE. A single amphora was raised for analysis (artifact number MN09-0003). Although marine growth rendered them unreadable upon recovery, a rectangular stamp is located on the lip and the stopper that remains in place has relief lettering and/or designs; this stopper also had a center knob. Similar stoppers, published by CPCH, have been found in Risan and Kotor bays. Likewise there are examples of Lamboglia 2 amphoras in the Kotor Maritime Museum and the Lady of the Rock Museum in the center of the bays. This wreck carrying Lamboglia 2 amphoras, particularly those with this type stopper, was likely enroute from somewhere in central Dalmatian coast, as recent research indicates this was the production area for this type particularly at Vis and Narona in Croatia. Current work in Risan and Kotor Bays is more difficult. There were 55 total anomalies in both bays and their investigation indicated geologic formations or modern debris. ROV operations were also conducted near Risan along the eastern shore where amphora fragments have been reported. Several amphora fragments and a possible whole buried amphora were located in the area, but no other finds were made in a wider search. Likewise, the multibeam data showed no evidence of architecture above the surface in the area where the ancient city of Risan purportedly sank into the bay. From the bottom conditions observed, it is clear that a large amount of sediment has buried ancient finds, and what has not been buried has been taken by the many years of looting in the bays. Local reports indicate the Yugoslavian army posted divers here for decades who had little to do but collect artifacts in the shallow bays. Other reports indicate individuals conducted regular looting of the bays as an illicit business in trafficking artifacts or selling ‘antiques’. This situation underscores the necessity for a comprehensive survey of Montengro’s submerged cultural resources as part of an overall management and protection strategy. Along with ROV operations to verify anomalies in Albania, two sites discovered in the previous season were visited for mapping with a new camera configuration and the use of new lights attached to the ROV’s deployment cage. 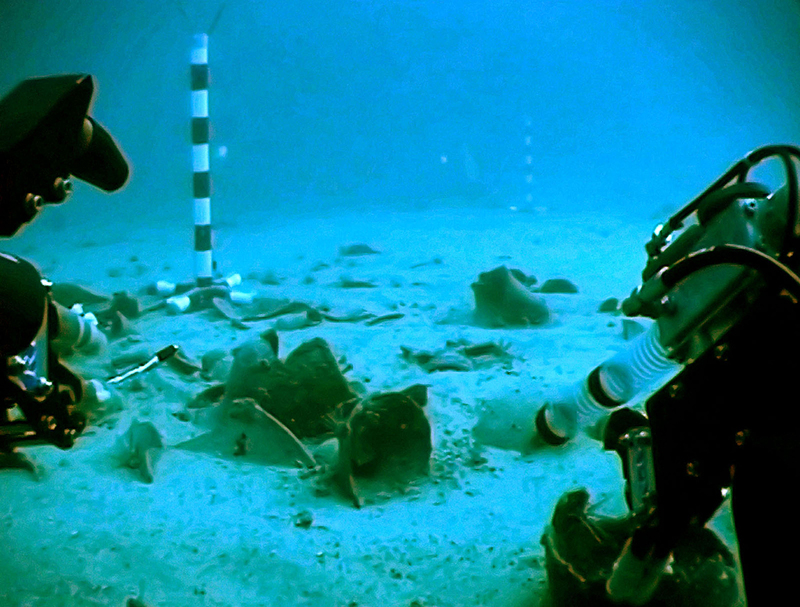 Both the Rodon wreck (AB08-AF, late 6th-5th BCE) and the Qefalit Tile wreck (AB08-AG, 4th BCE), which carried Corinthian cargos were video recorded. Given the additional lighting and camera configuration, the imagery improved from the previous season and it was possible to develop a workable photo mosaic for producing site plans. Additional amphoras were noted on the Rodon wreck protruding from the mud. To further the analysis of the Qefalit Tile wreck, an additional flat tile and the first cover tile were recovered from the site. This second pan tile collected from the site was intact, unlike the one from 2008, and measured c. 81 x 51 x 2.3 cm. It was found flat on the seabed with its upper surface settled into the sand. Upon recovery it was noted that its upper surface that was pushed into the sand was covered with heavy, older shell growth that was now deceased, while there was much less growth on the exposed bottom surface. Hence, the tile was relatively recently moved from the pile, perhaps the last 10-15 years, and flipped over onto the seabed; the dragnets in this area and at this depth are the most likely mechanism to have causee this disturbance. Additional photos and measurements were taken of the amphoras at the Butrint 2 wreck site (AB08-AH, 1st-2nd CE) in Albania, and investigation revealed more of the amphoras were visible than in the previous season; perhaps the different time of season incurs sediment removal at this time. The additional fragments were consistently of type Tropolitanian 1, the only type noted at the site thus far. Although it is not certain, a fragmentary African-type cylindrical amphora located some 100–125 m to the N of the site may be a Tripolitanian 1 as it exhibits a constricted waist and a similar toe. 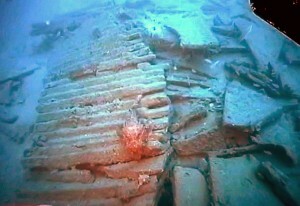 Supplementary video was taken of a modern site discovered in Albania in 2007 as part of an investigation into the remains being that of the Volage, a British warship damaged in the area in 1946. Its archaeological investigation is lead by Dr. Delgado of INA and a preliminary report has been published. Finds Over the course of the field season in Albania a dive survey was conducted along the shallow waters of the shoreline. Areas were defined by weather, accessibility, time constraints, and experience from the previous two seasons. As such, the coverage was neither systematic nor fully based on random sampling; hence, some statistically-based conclusions are difficult to draw. However, the significant area covered over the past three seasons, and that all sections of the coast in the survey area have been explored, do provide a useful sample. The remains are likely the primary result of jetsam as ships passed into and out of the Corfu Straits; hence they present themselves as random finds on the seafloor. The lack of recreational diving in Albania has maintained this record of random finds, one of the few places in the Mediterranean where such finds survive at diver depths. A few other random finds were discovered during ROV operations, yet the majority were documented in dive operations. 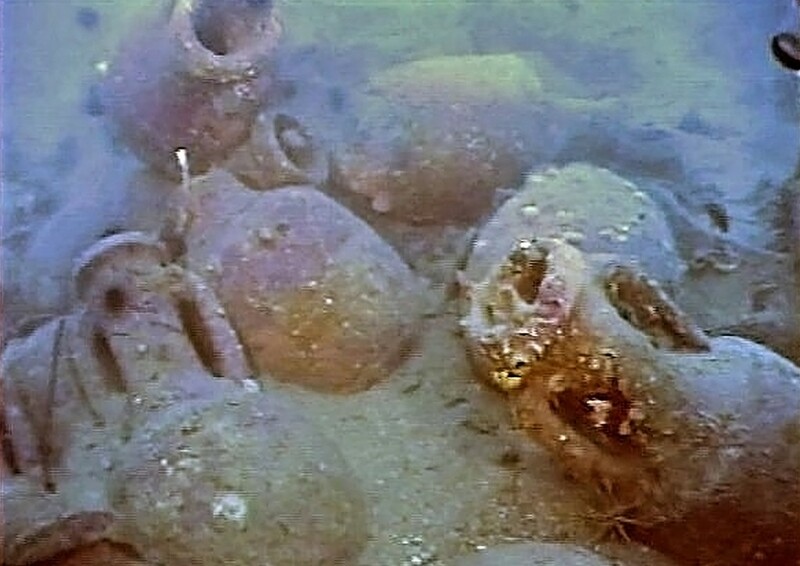 A majority of random finds are either intact, or nearly intact, amphoras and were located from the Greek border to the southern end of Sarande Bay, particularly south of the entrance to Butrint. In addition to amphoras, tableware from many eras is frequently encountered as well as various lead anchor stocks. Finds in Sarande Bay were scanty, and from the nature of finds from the late medieval and later periods, it appears that heavy silting in this bay has buried much of the earlier evidence. All random finds of amphora types are provided in Graph 1. Corinthian amphoras were the most commonly found, and type B Corinthian amphoras were twice as prevalent as type A. Late Roman amphora types were also common finds as were Greco-Italic amphoras from the Hellenistic era. The numerous examples of Corinthian amphoras speaks not only to the primary route through the Corfu Straits for merchantmen carrying goods further north, but also suggests this traffic was heavy and of a long duration. These finds underscore the evidence provided by the five shipwrecks carrying Corinthian goods thus far discovered. Within the long history of this traffic, both sets of evidence indicate the heaviest shipping during the 4th–3rd centuries BCE. This is also the period where a significant representation of Greco-Italic amphoras is noted in the sample. Whereas amphoras produced in the Adriatic such as Lamboglia 2/ Dressel 6, and Forlimpopoli types are common finds along the Croatian and thus far on the N Montenegrin coasts, only the Forlimpopoli type amphoras are well represented along the southern Albanian coast. During the 2nd–3rd century CE, Forlimpopoli type amphoras are common at Butrint, Durres and a number of E Mediterranean sites where their directed shipment was predominant. The working theory is this differentiation in finds is based on routes. Whereas ships coming out of the Adriatic heading east, commonly those carrying Forlimpopoli amphoras, would come through the Corfu Straits, while those merchantmen carrying Lamboglia 2 amphoras were headed more often to W Mediterranean ports and therefore crossed over to S Italy before reaching Corfu. Ships with Lamboglia 2 amphoras could run the eastern coast of the Adriatic to a point near Apollonia before crossing over to Italy; hence, further documentation of finds is crucial as the survey continues in both Albania and Montenegro. First published in Royal, J. 2009. “2009 Expeditions in Sicily” InThe INA Annual 2009:66-71. Since 2005, RPM Nautical Foundation (RPMNF) and the Superintendent’s Office of Underwater Archaeology in Sicily (Ufficio di Soprintendenza del Mare) have conducted a survey of coastal waters off the NW Sicilian coast. Over these past years, several areas have undergone intensive multibeam survey with ROV verification of anomalies. Efforts around the island of Levanzo, one of the Egadi Islands NW off of Trapani, have continued from 2005. In 2009, a project ventured into the southern coast, in the bay of Selinunte, to ascertain the efficacy of work in this region. A small survey was also conducted around Capo San Vito in 2007 and verification took place in 2009. Multibeam survey coverage in the three Sicilian project areas. Map by J. Royal, RPMNF. With a large amount of multibeam coverage completed from 2005–08, no additional multibeam survey was conducted during the 2009 season. A result of completing a considerable coverage area is a large number of anomalies that require verification. Although the number of anomalies is re-adjusted as new criteria and reviews are made, the number of unverified anomalies remains substantial. Based on experience and an evolving knowledge of the area’s seafloor topography, two strategies have developed for ROV operations. The majority of the survey area’s western sector features closely-spaced, low, and relatively small rock outcrops that observations have shown to ensnare drag nets. As such, this area is largely undisturbed by fishing nets except on its periphery where material is dumped when nets are snagged. The densely-packed anomalies and protection from drag nets often require area searches in the western sector. A rather clear and abrupt demarcation exists between the rocky western sector and the sandy seafloor of the central sector. As the central sector is largely devoid of rock outcrops, drag nets have flattened the sand cover and little biological or cultural material survives. All that is left is a barren, flat landscape; the only features are long drag marks that criss-cross the seafloor and an occasional flat rock outcrop protruding from the sand. Any cultural material deposited here in antiquity has been recovered by fishing nets and/or moved to rocky areas and dumped. The survey area’s eastern sector is a patchwork of rock outcrops and open sandy stretches; hence, dragging has impacted to some degree this area as well. Although the few anomalies explored in the central sector indicate little probability of surviving material, the western and eastern sectors hold potential. The Levanzo I wreck, discussed below, is located in the eastern sector. During the anomaly verification and area searches, random ceramic finds were located in the western and eastern sectors. A Roman-era commonware bowl and the upper portion of a Dressel 14 amphora were discovered in the eastern sector. Numerous random finds since 2006 have been found throughout this sector, the vast majority from the Roman era. Other finds noted but not recovered during operations in 2006-8 included the upper portions of Greco-Italic amphoras. Most of these amphoras were located on the edges of survey area’s central sector lying near rock outcrops; in a few instances the remains of snagged fishing nets were nearby. During the 2009 field season an intact Greco-Italic amphora was located here as well, and the decision was made to collect examples for analysis. Each of the amphora’s collected at the edge of the western sector were of the same type,—Greco- Italic—and possessed comparable dimensions and an asymmetry of their handles. This may indicate that these amphoras were produced at or near the same workshop, and at certainly a common time period. Once the locations of these amphoras from all seasons were plotted, there was a noticeable concentration in the NW section of the survey area where the rocky western section begins. Interestingly this is just slightly north of the Catherine D ram find location. The most likely scenario for these amphora finds is that they were dragged from somewhere in the flat central sector and deposited when the fishing nets snagged on rocks. Given the great similarity of the damaged amphoras, they likely originated from a single wreck site that settled in the central sector during the 4th-century BCE. Unfortunately, the site has been razed by nets and there may be nothing left of the site. Unlike near shore environments, the shallow sediments of deeper off-shore waters do not afford wreck sites the same protection; this is shown empirically in the Levanzo I wreck site investigation discussed below. 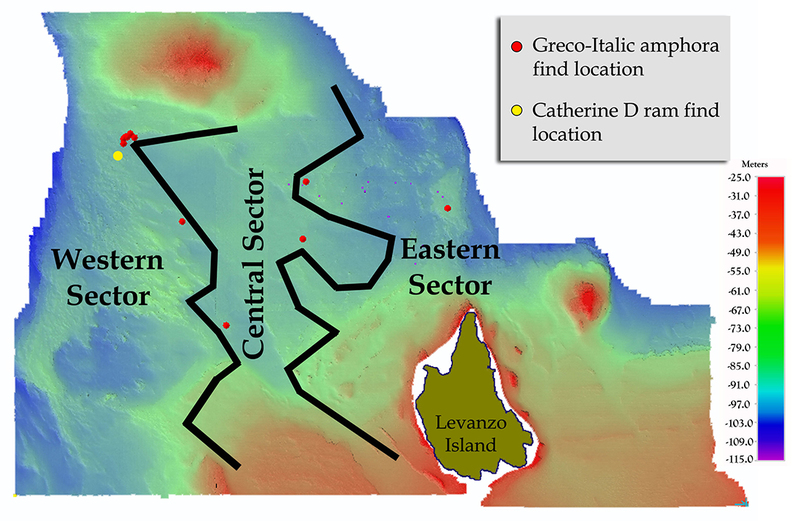 The Egadi Islands survey area demarcating seafloor topography sectors and find locations for Greco-Italic amphoras and the Catherine D ram. Map by J. Royal, RPMNF. One of the anomalies in the eastern section of the survey area was a relatively modern wreck site (Sulfur Wreck, SI09-AA). This site lies in c. 50 m of water and it was therefore possible to deploy divers as well as the ROV on the site. 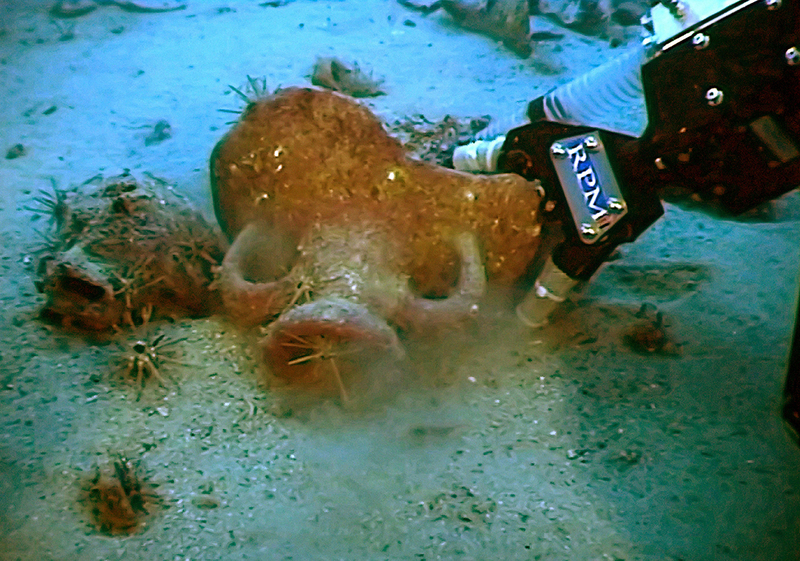 The primary visible remains of this wreck is a cargo of raw sulfur ore that forms a low, flat deposit. All of the sulfur cargo was fist- to head-sized chunks; many were rough hewn but others appear to have regular edges associated with their being quarried. Generally the deposit was 1–2 layers thick. One sample chunk was raised and a sample was taken for analysis by the Superintendant’s Office. Some wood, possibly ceiling planks, was visible just beneath the shallow covering of sulfur ore as were several unidentified iron objects. The condition of the wood and the degree of encrustation, as well as form of the iron objects indicate a relatively modern date for the site. Based on the flat and relatively shallow nature of the surviving wreck site, it has likely been scrapped by fishing nets. In addition to anomaly investigation, efforts were undertaken to further investigate the Levanzo I wreck site. This site, discovered during 2006 at the edge of the survey area’s eastern sector, c. 6 km N of Levanzo Island, was a 4th-century AD Roman merchantman laden with food stuffs and construction materials enroute from N Africa to the Italian mainland when it met its demise. At the time of discovery, little was known about the nature of deeper-water sites compared to that known about sites near shore. At a depth of 90 m and out of practical diver depth, it would seem such a site was safe from human exploitation and/ or damage, particularly to the illegal collecting by recreational divers that plagues shallow-water sites. Initial investigation of the site documented the damaged artifacts dispersed around the surface of this relatively flat site; it remained unclear as to how far the material extended into the sandy bottom. The wreck was mapped with various video/still camera combinations over the subsequent years. Additionally, a small number of artifacts were collected during the 2006 season in order to provenience the site, but no additional artifacts were collected until the 2009 season. During anomaly verification in the first two seasons, it became apparent that many parts of the survey area had been severely impacted by drag-net fisherman as discussed previously. By the beginning of the 2009 field season, it became clear that the Levanzo I site had likely suffered drag-net hits as well, which resulted in the scattered artifacts on the surface of a very slight mound. Considering the situation, Co-Director of the Project Dr. Sebastiano Tusa, Superintendent of Underwater Archaeology for Sicily, agreed the site required mitigation and arranged conservation support for artifact retrieval. Comparatively little is still known about the nature of the deepwater sites; however, with such projects as these, more is being discovered about these sites and the threats to them. Between discovery and the 2009 field season appropriate equipment, software, and methodologies were developed in order to properly map and test excavate the site to archaeological standards. The Levanzo I site’s particular characteristics also make it ideal for testing such equipment and methodologies that can later be applied to other sites. Although largely disturbed, every effort was made to control and record the provenience of artifacts thorough various methods of site mapping. A primary stratagem was the control of artifacts’ x and y coordinates because of the site’s greater scale and that the site is primarily surface finds. The initial step was to place pvc pipe and cement datums of 1 m in height around the site in order to provide reference points for measuring. These datums were integral in mapping artifacts and positioning imagery within Site Recorder software. Two methods were used for measuring the datums’ positions on the site: absolute and inter-datum measurements. Absolute positions were obtained by placing a beacon fitted with a hook on each of the datums with the ROV. The beacon positions were recorded on Hercules and displayed upon the surface model of the seafloor with IVS Fledermaus software. Once the positions were plotted on the seafloor model in Fledermaus, the depths at those positions could be ascertained from the bathymetric data. These beacon positions also provided real-world location and orientation for the wreck site. Inter-datum measurements facilitated by a high-frequency sonar fitted to the ROV were also used to ascertain datum positions. This sonar clearly images the datums and small objects within a 180o sweep that covers the entire site as it is relatively flat. In the sonar’s software, sweep images are recorded and precision measurements are possible between or along any visible object. In order to increase the accuracy of measurements, the ROV was placed in three different vantage points around the site. 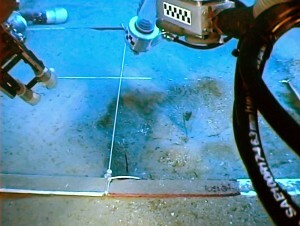 Additional recordings and measurements were made during subsequent positioning for measuring temporary datums, or at any time the ROV was at rest on the periphery of the site. With each datum identified in the various sonar recordings, between 5 and 10 measurements were made between any two datums. Statistical outliers of measurement values were ignored and the remaining cluster of measurements was averaged; this inter-datum distance value was used in Site Recorder. Both the inter-datum and beacon positions were interpolated in Site Recorder, and along with bathymetric depth data provided a good representation of the datum positions. With the datum positions plotted on the seafloor model in Fledermaus, it was possible to ascertain the site’s height profile. A 30-m transect was taken on the surface map across the SE portion of the site, between datums D1 and D6, at a right angle to the site’s long axis. Over this 30-m distance, the highest point on the site rises less than 30 cm, some of which is likely due to the rock outcrops that lie beneath the surface and are exposed around the site. These rock outcrops rise to c. 35–40 cm off the seafloor around the site, and are undoubtedly the direct reason for any part of the wreck surviving as they deflected drag nets slightly over the site. However, any of the material above the height of the rocks when the shipwreck first settled here was now gone. The result is a flat, shallow site ideal for a trial of mapping and excavation methodologies. Further recording of the site included video with a downward facing camera in order to document the site with datums in place and produce a photo mosaic. 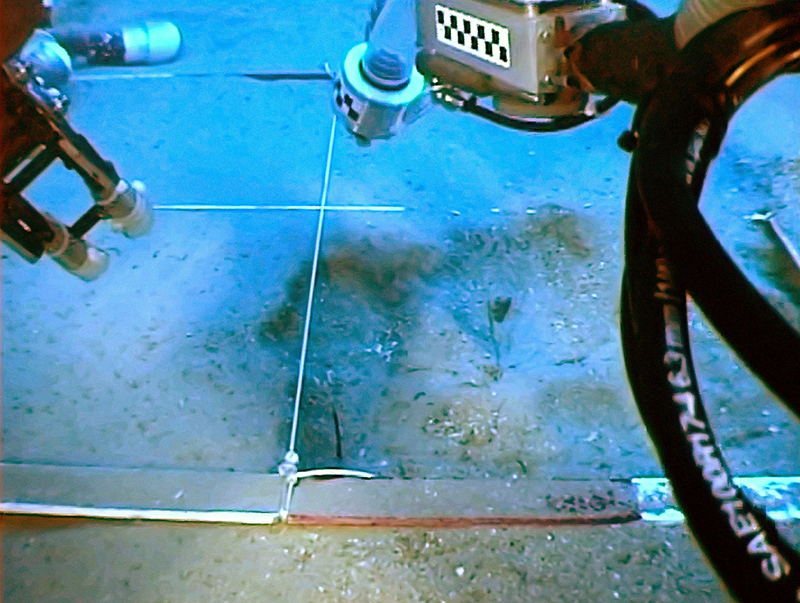 The ROV remained 4–5 m over the site to obtain good contextualized images. For the mosaic, the wider-scale images from 2009 were used to formulate the general image of the site area; afterwards, the more detailed still photograph images of artifact groupings obtained in 2006 and 2008 were overlain. The mosaic was then imported into Site Surveyor and aligned according to the matching of datum positions. A combination of recording methods were now available to ascertain the locations of surface artifacts, and allowed the measurement of the features and objects in the mosaic. With the mapping and provenience under control for the site, it was possible to proceed with the collection of surface artifacts for analysis; the majority of which were intact or fragmentary amphoras. As a final experiment in the ongoing assessment of the Levanzo I wreck site, two small test excavations were conducted. Excavation was limited to two 1-m squares at the center of the site where it was largely free of surface artifacts. A form constructed from flat aluminum and painted red/white in 25-cm increments, and bolts attached through the corners to resist shifting after placement. Based on the method commonly utilized when recording sites in dive operations, the square was segmented into four 50-cm2 quadrants, A–D, and each quadrant further subdivided into four 25-cm2 sub-quadrants, designated 1-4. Hence, during excavation the notations made record artifact positions based on this quadrant system. Once placed on the seafloor, a video flyover recorded its relative position. Additionally, temporary datums were placed on two opposing corners and their positions were recorded with the sonar and measured in relation to the seven datums; the position of the square was then interpolated in Site Surveyor. ROV view of the Levanzo I site while sitting on bottom, between datums 3 and 4; Center: datum positions in IVS Fledermaus software and transect position over site; Bottom: profile of transect showing cross-section of seafloor. Graphic by J. Royal, RPMNF. A water dredge on the ROV performed the excavation duties, with all dredged material run through a mesh bag that was examined on deck. The dredge featured a collar specially designed to shoot short bursts of water from six 2-mm holes in order to break up or move sediment for easier dredge operations, akin to handfanning. However, the jets were not required in the upper layer of easily-removed loose sand. The jet collar was necessary in order to remove the underlying dense mud layer excavated to a limited degree in order to test for the presence of artifacts, which included a 15-cm deep sondage in one quadrant. Depths of sediment layers and artifacts were ascertained with scales held in the ROV manipulator arm or by those affixed to the dredge. When artifacts were encountered in the square, and noted in the log, they were removed with the manipulators, or more often through the suction of the dredge, to a small basket next to the excavation square. A description of individual finds from the excavation, along with their analysis and implications, will be detailed in an upcoming publication. Video recording provided a second, and important, record of all excavation. With real-time video of excavation it is possible to recreate and review all work performed, as well as creating a permanent record of the event. As such, the provenience of artifacts within a square can be determined and rechecked if necessary, and any assessment of sediment in relation to the artifacts is also reviewable. This recording utilized three separate cameras: a down cam, a pilot cam, and a manipulator cam; thus, it was possible to obtain a plan view, a forward perspective view, and close-ups of the work performed. Furthermore, video was facilitated by two powerful lamps attached to the ROV’s deployment cage (TMS) and pointed downward. With the TMS positioned above the excavation square, a much improved image was attained with truer colors and much less particulate visible in the water column. Based on excavation in both squares the upper sediment layer on the site is a medium-grained, light-color sand 5-7 cm thick that was mixed with shells and small rock fragments. Below this layer is a harder packed mud layer slightly darker in color. This underlying layer density required mechanical break-up in most cases to dredge. All artifacts were found either on the surface or in the loose upper sand layer; the 15-cm deep sondage extended approximately 10 cm into the dense layer with no artifacts encountered. As the test squares were in the central portion of the site that is largely devoid of ceramic concentrations, the sandy upper layer is slightly thicker on the NW and SE portions of the site. The depth reached 10–15 cm where a slightly buried amphora was removed on the SE end of the site. This shallow sand cover on the site provides virtually no protection to the artifacts from further drag net incursions. Consequently, the ceramics exposed on the seafloor upon discovery were almost all that remained of the cargo due to the devastation of the drag nets. This reaffirmed the necessity for mitigation for this site, and illustrates the peril that offshore sites face. The Levanzo I wreck is similar to many others in deeper waters, where sedimentation rates are lower than those at the shore and can leave wreck sites largely exposed. In fact, this may be the norm rather than the exception for sites further offshore. The particular threat of drag nets is amplified as they dig into the sandy surface layer, and given the lack of sand cover for offshore sites, the damage they do is catastrophic. Unfortunately it is probably too late for an untold number of wrecks throughout the Mediterranean. Excavation on the Levanzo I site utilizing the metal square and the ROV’s water dredge. Photograph courtesy RPMNF. The opening mission for the 2009 field season brought the RPMNF research vessel Hercules and crew to the SW coast of Sicily. This ambitious project entailed a survey of the SW coast with the goal of moving eastward; however, one also undertakes the task of assessment during the initial season in any previously unexplored area. 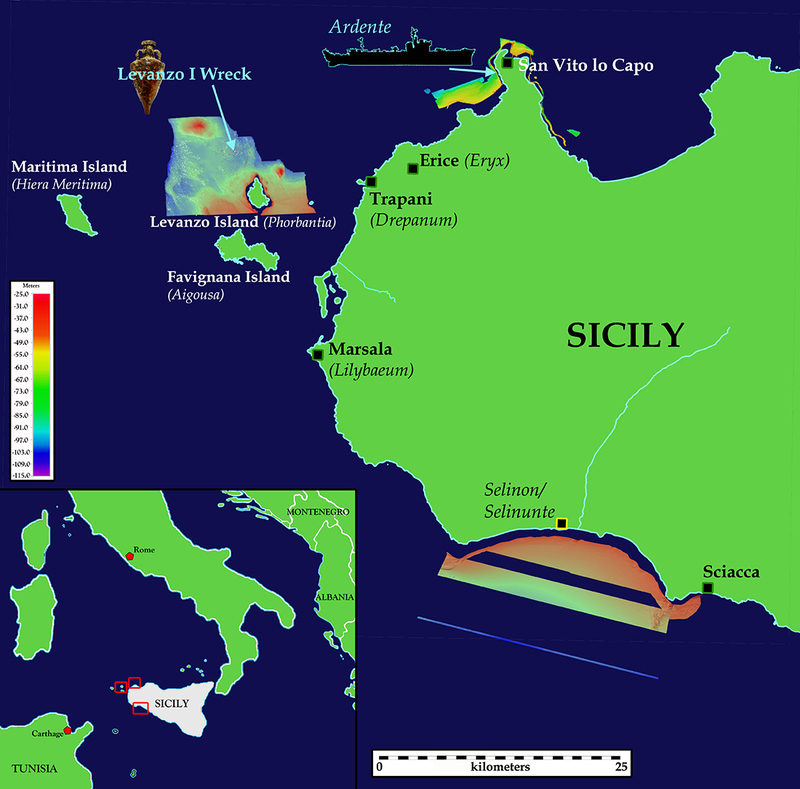 For 2009, the survey centered in the elongated bay of Selinunte that spans between Capo Granitola to the west and Capo San Marco to the east; just east of Capo San Marco is the port town of Sciacca out of which the team operated. The bay is named for the ancient town of Selinunte, Greek Selinon, that is now a 1740-km2 archaeological park. As one of the most important Greek cities in Sicily, Selinunte thrived during the 6th–5th centuries BCE when numerous temples were constructed on and around its acropolis situated between the two small rivers Cottone and Modione. The city was founded in 7th Century BCE by colonists from Megara Hyblaea, a town located near Syracuse to the SE, and was largely destroyed in 409 BCE by the Carthaginians. In c. 250 BCE, during First Punic War, the Carthaginians abandoned the city, destroyed most of it, and consolidated in Lilybaeum to the west. Major damage to the temples was probably a result of an earthquake in the Byzantine era. In addition to the Cottone and Modione rivers, the mouth of the 77-km long Belice River located 4 km E of Selinunte empties into the bay; recently this river is seasonally active due to agricultural demands. Geologic investigation around Selinunte and the bay indicate a complex and active past due to the numerous faults running through the area. This section of coast has experienced subsistence and uplift, and the bay is filled with sediments from the last marine ingression that followed the latest glacial era. Adding to this sedimentation are the outflows of the Belice, Cottone, and Modione rivers. Although three productive weeks were completed, results of the survey are limited to an assessment for further work. Analysis of multibeam data produced few anomalies and showed a largely featureless seafloor. Limited ROV verification operations were attempted, and together with a small number of dives on shallow targets, problems with this area for survey were confirmed. The rivers empting into the sea have created a sand build-up near shore that may preclude the detection of ancient-medieval shipwrecks. Divers reported a modern sailboat sitting upright on the seafloor and buried to its sheerwale in soft sediment. Hence, it is likely that ancient-medieval material is buried within the bay and will have to await storm action for the opportunity to detect. Survey moved further out from the bay and a few test lanes were run at the outermost edge. ROV prospection beyond diver depth noted this sediment cover likely decreases with distance from shore; however, there was evidence of drag net incursions on the seafloor. Assessment indicates the area mirrors that of the central portion of the Egadi Islands Survey area; in such areas were drag nets have been frequently used, further work will have little use. This finding was somewhat unexpected as the chart of the area provides a caution in or near the bay for ships not to anchor, dredge, trawl, lay cables, etc. due to obstructions and unexploded ordnance. Retrieval of surface artifacts with ROV. Photograph courtesy RPMNF. A strategic plan for future work would include monitoring the bay for the impact of large storms that could remove sand cover, even temporarily. Other areas on the southern coast should be assessed as well, particularly those reported to have enjoyed protection because of pipeline, fishery, etc. in the zone. Likewise, areas that have significant rock outcrops that would also deter drag net operations. Prospection with the ROV between the 50- and 120-meter contours to assess for the amount of sand accumulation and geologic features may be an efficient first step on the southern Sicilian coast. The early 5th-century BCE Gela shipwreck discovery, over 800 m from shore at c. 5 m of depth, highlights the importance of this stretch of coast, particularly given the presence of ancient Greek cities such as Selinute, Agrigento, Gela, and Syracusa. Heavy sediment cover helped preserve the Gela wreck, yet also compounds the detection of such wrecks. Corinthian trade was heavy in Sicily, however, as with Albania and Montenegro little is known of the offshore waters on this portion of the Sicilian coast and what sites are present to address such research questions. San Vito Lo Capo In the course of the 2007 field season, multibeam survey was conducted around Capo San Vito at the request of the Superintendent’s Office of Underwater Archaeology to the search for a WWII-era British submarine Thunderbolt reportedly lost in the vicinity . As the area was promising on several levels, the survey circumscribed the cape. The multibeam data was examined for the presence of the submarine alone; a promising anomaly was located and its location transmitted to the Superintendent’s Office of Underwater Archaeology at the end of the 2007season. The most promising anomaly was comprised of two large sections near one another, the larger over 50 m in length. A brief attempt to verify the anomaly was halted that season due to equipment problems, and the ram discovery of the following season precluded a return. Special efforts were made during the 2009 field season to verify this anomaly that was clearly the remains of a large, modern vessel. In August, the team moved from Levanzo to the site’s position and the ROV was deployed. Video of the site clearly indicated there were two large sections of a single WWIIera naval vessel present, separated by approximately 75 meters. Upon viewing the superstructure it was clear the vessel was not a submarine, but a type of torpedo ship. As in other areas investigated, fishing nets were tangled in the wreckage. Observations and notes were taken by Dr. James Delgado of INA and Stefano Zangara of the Superintendent’s Office of Underwater Archaeology. Dr. Delgado’s experience with WWII-era vessels assisted in the initial identification of vessel type, as well as noting the massive damage the vessel incurred. Subsequently, Mr. Zangara’s research4 provided an identification for the vessel: Ardente, a cyclone-class torpedo ship in the Italian navy. Deployed in 1942, the 910-tonArdente was one of 16 vessels of this class with a length of 87 m, a 9.9-m beam, and a draft of 3.7 m. These torpedo boats were armed with antiaircraft guns, depth charge throwers, and four torpedo tubes. Ardente sank the submarine HMS P48 in December of 1942, and shortly thereafter on January 12, 1943, official reports indicate it struck the Italian destroyer Grecale while in convoy. However, the location for Ardente’s sinking was reported near Punta Barone, on the island of Salina, one of the Aeolian Islands, on the NE coast of Sicily. The work by the Superintendent’s office has clarified this chapter in Italian naval history. Even with the rather narrow band of depth contours for which the multibeam system can effectively survey, the amount of sediment coverage is minimal compared to the southern coast. Sediments from the high peaks near shore along the N coast are undoubtedly settling slightly further offshore at depths over 300 m. Whereas the 100-m contour is often over 25 km offshore off the southern coast, it is not uncommon to reach depths of 300–800 m, 5 km off the northern coast. As such, the 2010 survey plan will focus new multibeam survey from Capo San Vito towards Cap Gallo at Palermo, and eventually to Capo Zafferano at the eastern point that forms the Bay of Palermo. View of Levanzo I wreck site during sonar imaging, note the flatness of the site and a temporary datum. Photograph courtesy RPMNF. First published in Royal, J. 2008. “Albanian Coastal Survey Project: 2008 Field Season.” In The INA Annual 2008:21-25. On the heels of an enlightening, educative, and successful inaugural expedition, the 2008 field season of the Albanian Coastal Survey Project proved equally rewarding. Multibeam survey of the shoreline continued northward and included Porto Palermo, while diver investigation addressed selected areas of the shoreline. RPM Nautical Foundation (RPMNF) provided equipment, personnel, and funding to carry out the project and worked in partnership with the Instituti i Arkeologjisë (Albanian Institute of Archaeology-AIA) as well as the Ministry of Culture and Tourism. Directed by Dr. Adrian Anastasi (AIA) and the author (RPMNF) the project received crucial assistance from Auron Tare of the Butrint National Trust, Dr. Neritan Ceka (AIA), and Dr. Nicolle Hirschfeld of Trinity University. Dr. Hirschfeld’s participation included the ongoing assessment of the Butrint I wrecksite, an early 3rd-century BCE amphora carrier, as a potential INA excavation project. The Ministry of Defense made generous contributions to the project in the use of their naval base at Saranda. Additionally, the Waitt Institute for Discovery provided financial support for several dive volunteers and Dr. Hirschfeld. Surveyed area at the completion of the 2008 field season. Map by J. Royal. A two-month period of July and August were slated for both phases of the project. The naval base at Saranda served as the operational center for both multibeam and diver operations, as RPMNF’s vessels and dive support containers were provided dockage and storage space. The survey began at Albania’s southern border with Greece in the 2007 field season with a goal to move systematically northward and complete a multibeamsurvey of the seafloor between the 25 and 120-m contour. By the end of 2008, the completed multibeam survey area reached past Saranda to Kakomea Bay just north of Cape Qefalit; a point approximately 37 km from the southern border. An additional area of multibeam survey was conducted in, and on the outer portion of, Porto Palermo, and included efforts to fill gaps from 2007. 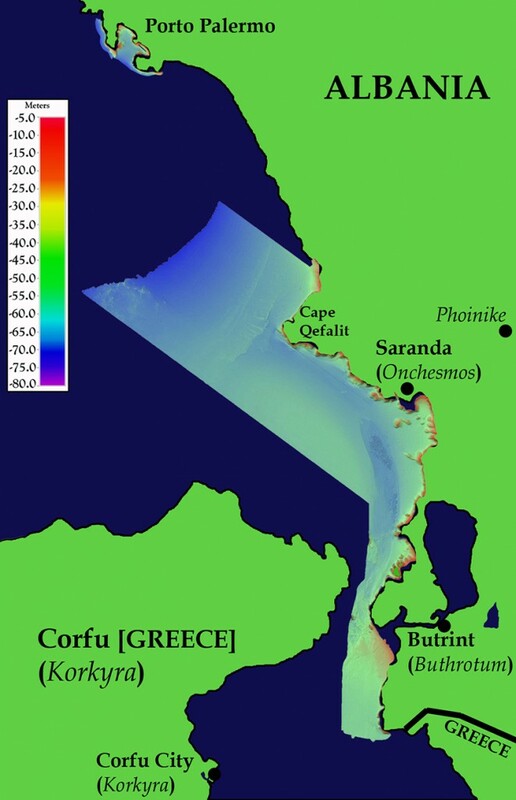 Much of the survey was limited to the midpoint of the Corfu Straits, approximately the 80-m contour, which was typically a few kilometers from shore. However, north of Corfu the survey reached out to the 100-m contour to areas over 10 km offshore. The diver investigation was conducted in selected spots along the shoreline south of Saranda where divers reached the 35-m contour. As dive operations are less efficient, only small sections of the shoreline in the survey area were completed. For both phases of the expedition, the sediment outflow of the Butrint River was an obstacle in that the heavy deposits have buried cultural deposits near its mouth. Anomaly verification by the ROV in deeper waters along with the diver investigation discovered during the 2008 field season resulted in a total of nine wrecksites, two significant artifact concentrations, and numerous random finds. Five of the wrecksites were modern, while the remaining four were from the Greek and Roman eras. Although there were over 50 anomalies remaining at season’s end, these will be a reassessment of many anomalies located in areas with verified geologic formations and where mud-mounds formed by the prevailing currents were discovered. Corinthian B amphora of the late 6th–early 5th century BCE (AB08 AF-0001). Photograph by J. Royal. All five of the modern sites are ships or other material from the 20th century, four of which are likely associated with military craft. A WWII-era minesweeper located several kilometers outside the Butrint River mouth has buried to a significant degree due to the sediment outflow of the river. RPMNF detected this vessel during the 2007 field season and the Waitt Foundation was provided with its coordinates in order to test their ROV and recording capabilities. Its steel structure is relatively well preserved and many construction features remain visible. It is possible this wreck is the 1000-ton HMS Regulus reported sunk by a mine in the Corfu Straits on January 12, 1945. Regulus was an Algerine-class minesweeper built in 1943 that measured 235 feet in length and had a beam of 35.5 feet. Investigation of another deposit resulted not in a ship but rather the landing craft carried by a likely WWII-era military ship. Two armored transport vehicles were located 60 m apart from one another and approximately 3 km off Cape Qefalit. Both vehicles lay upside down and are covered in netting; these nets are snags from fishing in the area. Their engine blocks, chassis, and large tires are all clearly visible. Photographs sent to the Imperial War Museum in the United Kingdom indicated the tires and vehicle attributes are consistent with those of WWII British military vehicles. Although unknown, it is possible these vehicles were part of the British invasion forces at Kakomea Bay. Also off Cape Qefalit, and near to the armored vehicles, rests a metal wreck that carried 50-gallon metal drums and large tires as part of its cargo. These tires are of similar dimensions and type to those found on the armored vehicles. It is not possible to firmly date such a wreck based on this material alone, but the nature of this material in conjunction with the nearby WWII-era material argue for a similar period. The remains of two warships are also among these modern-era sites. At the entrance to Porto Palermo a small warship of circa 30 x 7.5 m sits at a depth of 77 m. Its metal hull and decks are relatively well preserved, yet the ship is buried in the heavy sediment endemic to this natural harbor. Its large stack at midships and single large gun situated at the bow, with a possible stern placement as well, indicate a vessel that operated during the first decades of the 20th century. Another modern find was the remains of a metal hull replete with scattered tableware, many large and small concretions, and other unidentified objects; the type and nature of the deposit is yet undetermined. A concentration of sherds among, and fused into, the rocky shore. Photograph courtesy of RPMNF. One of the more immediate findings from the previous season’s fieldwork was a high representation of material from ancient Corinth and Korkyra (modern Corfu) in this area. The Butrint I wreck discovered that same season highlighted the significant presence of Corinthian amphoras from the Archaic through Hellenistic periods. Conspicuous is the lack of finds from other areas of Greece, or for that matter, the greater eastern Mediterranean. 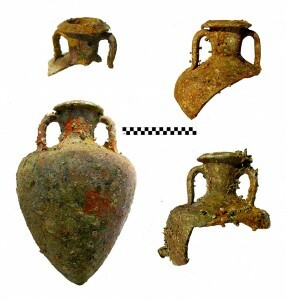 The 2008 field season underscored these findings as three of the four ancient wrecks discovered were laden with Corinthian material, and the majority of amphora concentrations and random finds were also of Corinthian origin. Investigation of a mound situated only a few kilometers off Cape Qefalit revealed the remnants of a merchantman’s cargo. The site is dominated by a c. 15 x 6-m ovoid mound of sandy mud, approximately ½ meter high with a scatter of amphoras protruding from its surface. Approximately 8 to 10 of the amphoras appear intact, many of these buried with their mouths protruding out of the mud. The majority of the remains are of amphora portions and large sherds scattered about. Undoubtedly the drag nets used in this area damaged the wrecksite over time. 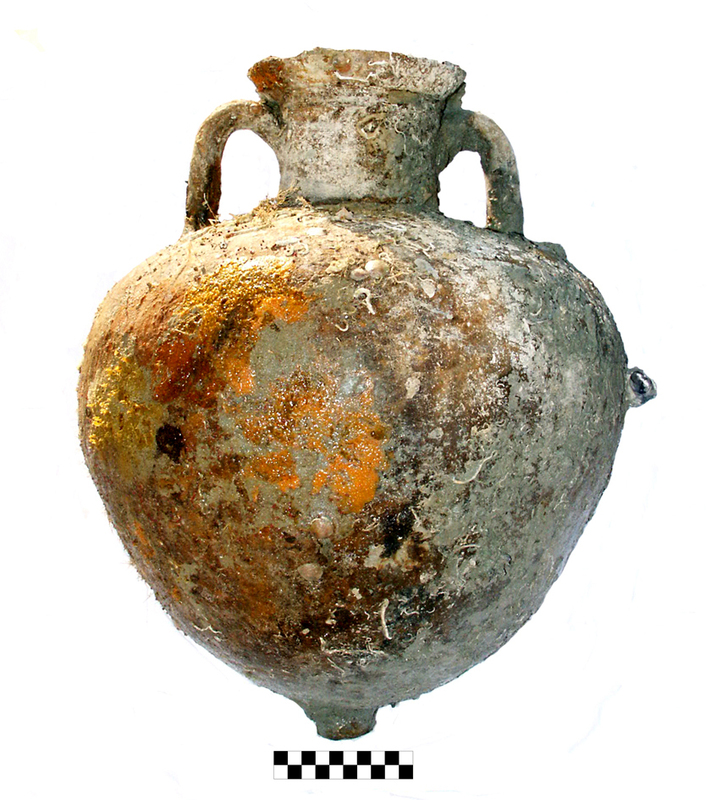 After a systematic imaging fly-over of the site to produce a plan, one intact amphora was identified for retrieval in order to provide identification and a date range. Once taking the amphora’s position on the site with the ROV, a small amount of mud was removed from directly around its buried base. Once sufficiently freed from the sediment, the amphora was retrieved and field recorded onboard Hercules. This squat, globular amphora was of Corinthian form B produced from the characteristic yellow-hued fabric associated with ceramic production at this ancient city. Its shape and attributes indicate a date in the late 6th to early 5th century BCE. Another wrecksite discovered in shallow water south of the Butrint River mouth had similar Corinthian amphoras as the previous wreck. Unlike the deeper wreck, however, this wrecksite sits upon shoreline rock that receives large wave and storm churning, as well as rock tumble from the adjacent hillside. Consequently the amphoras here are badly damaged and broken in many small fragments covering an area of about 20 m2, with several sherds noted buried under rock tumble. Most of the exposed fragments are covered with growth and it was common to encounter sherds fused into the surrounding rock. Fortunately, several intact upper portions and bases were available for analysis that indicate a Corinthian cargo of a date between the late 6th to mid-5th century BCE. A cargo of roof tiles, many of which remain in their stacking pattern. Photograph courtesy of RPMNF. An interesting deeper wreck found over 7 km off Cape Qefalit remains in good condition despite its exposure to fishermen’s drag nets. The reason for its comparatively good condition is in large part due to its cargo of roofing tiles. Instead of individual amphoras that can separate as a wreck degrades and settles, this tile cargo is stacked and forms an interlocking and compacted deposit. Once partially buried in the sand it forms an integrated deposit resistant to displacement. Both pan and cover tiles are present in the cargo that extends some 15 m in length and 6 m in width. Fewer than 10 amphoras were noted in the investigation of the site, and the majority of these were located on one end of the deposit. A full video recording was made of the site that will assist in producing a site plan. A single fragmented pan tile lying at the edge of the site was removed for examination. Its flange angle and dimensions are characteristic of Greek types and the yellowish-brown color of the clay indicates Corinthian manufacture. Corinth was widely renowned in the ancient world for its high quality tiles, these being used in large-scale construction across the Aegean. Additionally, one intact amphora at the edge of the site and one upper portion of an amphora lying circa two meters off the site were collected for identification (Figs. 6–7). Both collected amphoras are variants of type Corinthian A; at least one Corinthian B type amphora was also noted on the site. Each of the collected Corinthian A and observed Corinthian B types from the site are consistent in form with those of the 4th-century BCE. Interestingly only one of the collected amphoras possessed the yellow-colored fabric typical of Corinthian origin. The other had a reddish-brown paste associated with ceramics produced on Korkyra; a find congruent with the recent discoveries of kiln sites on Corfu that produced amphoras of Corinthian form. The mix of finds on a wreck located here transporting building materials further north highlights the regional economic integration of the northern Ionian and southern Adriatic coastal communities. While Corinthian A and B types were among the random finds along this southern shore, there were at least two small concentrations of Corinthian amphoras in the area south of the Butrint River mouth opposite Corfu. 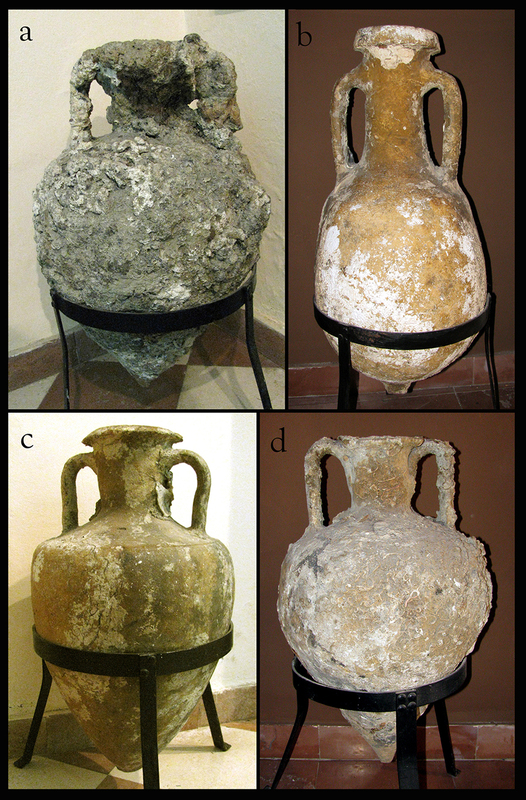 Each of these two artifacts concentrations has 7–10 amphoras, several of which are buried to varying degrees; however, in neither case were large concentrations detected from limited hand probing into the sand. One of these deposits consisted of all Corinthian B amphoras of 3rd-century BCE form; thus, it is possible that a wrecksite lies buried here or in the vicinity upslope. The second deposit has greater chronological diversity, ranging from the 5th century BCE through the Roman Imperial period, and includes both Corinthian types some of which may be Korkyran in origin, along with Roman variants. It appears this deposit is also buried to some degree; although not characteristic of a wrecksite, such mixed deposits are usually formed by jetsam from vessels waiting at a natural shelter or anchorage. Corinthian pan tile fragment (AB08AG-0002). Photograph by J. Royal. This high representation of Corinthian, and to a lesser extent Korkyran, evidence for material shipped through the Corfu Straits northward speaks directly to Corinth’s economic involvement in this region. The inhabitants of the coastal lands from the northern Ionian portion of Greece through southern Croatia associated themselves at different periods with the kingdoms of Illyria and Epirus. Here Greek city-states vied amongst themselves for economic advantage in part through trade relations with established cities, and through the foundation of colonies in areas with desired resources and/or markets. Although independent, Greek colonies frequently maintained special economic and political ties with their founding cities, which was often demonstrated, for example, by their mimicking of the founding city’s coinage. 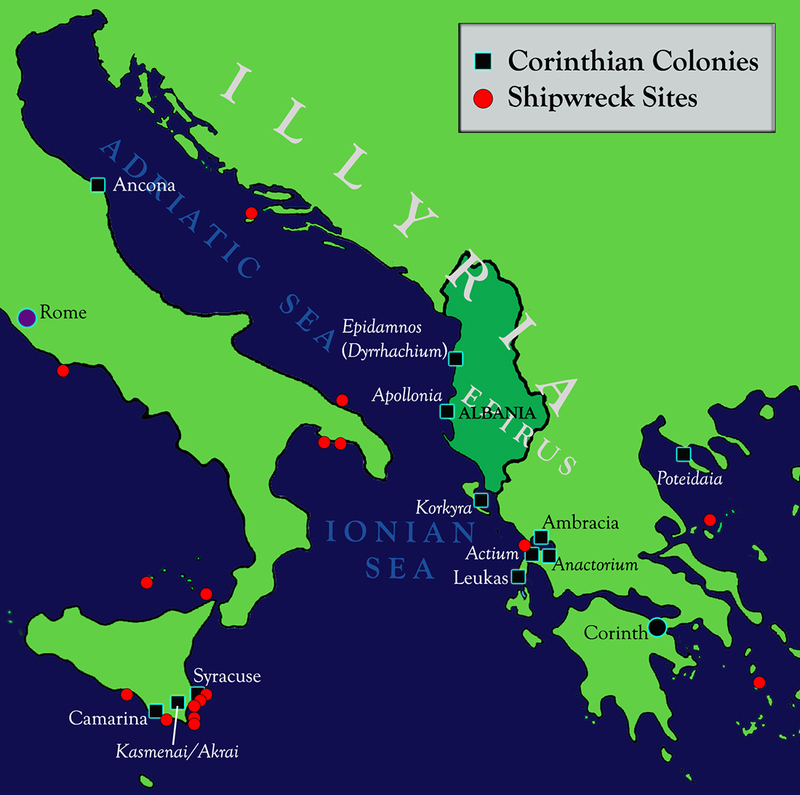 Colonization efforts by Corinth extended from Sicily to the southern Adriatic, and include the foundation of Korkyra (modern Corfu City) as well as Epidamnus (modern Durres) and Apollonia in Albania. Over time these colonies blossomed into cities whose wealth and power both supported, and yet sometimes rivaled, Corinth. Present evidence for Corinthian type amphoras on shipwreck sites, and at numerous land sites, are correlated with the location of Corinthian colonies along with the overseas routes connecting them. Most of these shipwreck sites date to between the 2nd and 4th centuries BCE. Prior to this survey, excavations on Corfu, and at Apollonia, Durres, and a few other Albanian sites provided the primary evidence for the distribution of both Corinthian amphora types in the Adriatic. Hence, the emerging maritime evidence for the robust, and nearly exclusive, shipping of Corinthian goods in the S. Adriatic-N. Ionian emphasizes the particularity of trade relationships and the resultant economic integration of the region. Furthermore, the two wrecksites with late 6th/early 5th century BCE Corinthian cargos provide some of the earliest direct evidence to date for such overseas exchange. It is envisioned that the Albanian Coastal Survey will continue to provide maritime evidence for long-distance exchange in Corinth’s economic sphere, as well as other cities and states of the greater Adriatic, and possibly wider Mediterranean, region. Among the single amphoras scattered both along the coast, and in deeper, offshore waters, were numerous ceramic examples from across the Roman era. 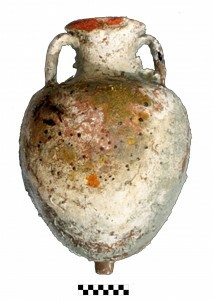 Among these were some of the most common amphora types found in this part of the Mediterranean, which included Greco-Italic and Lamboglia 2 variants dating to the Republican period as well as Imperial Dressel 6 and Late Roman 2 types. In addition to the many random finds, the survey recorded the cargo remains of a Roman shipwreck located south of the Butrint River’s mouth. The site’s surface is comprised of around five nearly intact portions and numerous large sherds partially buried in the sandy slope. All of the amphoras observed on the site, as well as a neckrim- handle fragment raised for analysis, appear to be of type Tripolitanian I. These large, cylindrical amphoras were over 1 m in length and produced during the 1st and 2nd centuries CE to carry olive oil from North Africa. Research on fabric analysis indicates that this amphora type was primarily produced in two areas, modern Tunisia and Libya; on initial field analysis, the fabric of the raised fragment corresponds to the former. Beyond a local North African trade, evidence for the overseas distribution of Tripolitanian I amphoras comes primarily from the Eastern Mediterranean and Italy. Smaller variant of a Corinthian type A amphora found exposed on the tile wrecksite (AB08AG-0003). Photograph by J. Royal. First published in Royal, J. 2008. “Exploring the Shores of Ancient Illyria” In The INA Annual 2008:26-28. There are compelling aspects for working in the eastern Adriatic-northern Ionian Seas for an archaeologist. Besides the relatively little archaeological research preformed in the waters south of Croatia, the length of this coast was once home to the ancient Illyrians. This amalgamation of tribes formed a sometime loose state whose people were the ancestors to today’s inhabitants of Albania, Montenegro, and Croatia. The confederation of chiefdoms forming what is first regarded as the Illyrians began to coalesce around the 13th century BCE, and became a prominent political force by the 5th century BCE. Their rise brought them into contact with the expanding number of Greek settlements and eventually their incorporation into the Roman state. Among many cities either founded or overtaken during the Illyrian era of preeminence were Skodra, a seat of many Illyrian kings, and Byllis in Albania, as well as Risan in Montenegro. As Illyrian power rose, Greek cities along the coast came under their sway as far south as Butrint; although Alexander briefly checked Illyrian independence until his death. Reinvigorated entering the 3rd century BCE, Illyrian attacks on Greek coastal cities and Adriatic shipping fueled their re-emergence as a regional power. The legendary Queen Teuta moved the Illyrian capital to Risan, some 20 km inland, as Risan and Kotor Bays (Boka Katorska) offered a safe port for preying Liburnia. From here Illyrian raiding at sea become a significant enough threat to force a Roman reprisal. After an eventful reign of three years, Teuta abdicated as part of the settlement with Rome in 227 BCE. Eventually, the growing power of the kingdom of Epirus and further forays into Illyria by the Romans at the end of the 3rd century and into the 2nd century BCE helped Illyrian confederation. Although it succumbed to Roman forces, the cultural construct of Illyria survived as the province of Illyricum formed in 125 BCE. By 77 BCE, Dalmatia was folded into the Roman province and the incorporation of the final Illyrian territories was completed by 59 BCE. Tiberius crushed a last rebellion by Illyrian tribes in 6 CE three years later and under Imperial rule the province flourished with many cities growing in prominence as Illyrian culture was woven into the fabric of the Roman world. Although a reconfiguration in early 2nd century CE left former Illyria segmented into the provinces of Dalmatia, Macedonia, and southern Pannonia, under Diocletian much of the southern Balkans through Macedonia, Greece, as far as Crete became the Prefecture of Illyricum. 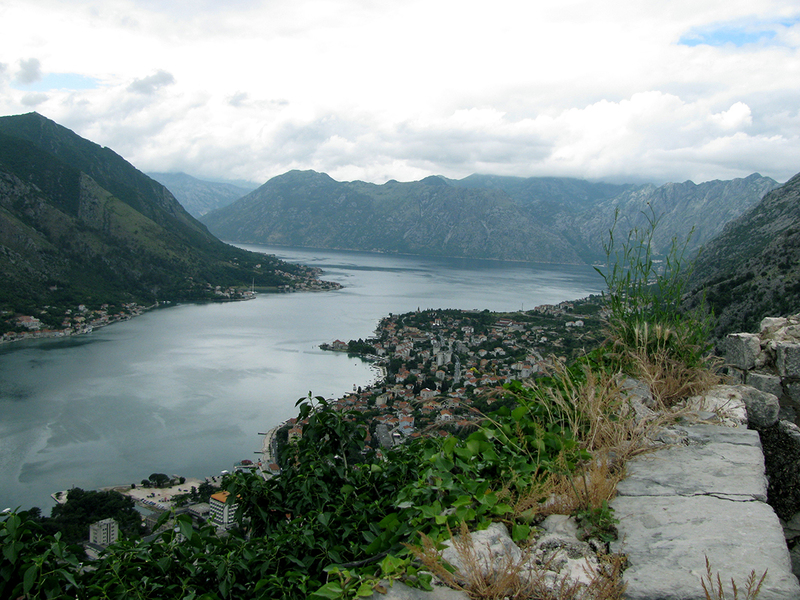 View of Boka Katorska from atop the medieval fortress above Kotor, ancient Risan was situated around to the right in the bay. Photograph by J. Royal. Through the 2008 field season in Albania, the discovery of numerous shipwreck and artifact finds carrying Corinthian goods established this city as one of the foremost in the Greek settlement efforts along the shores of Illyria. Little is known, however, about colonization efforts and the nature of trade north of Apollonia. Maritime evidence of Roman trade from southern Albania is also present, to a lesser extent relative to Greek evidence, but does indicate widening Mediterranean contacts. Although the cities that rose to prominence during the Roman period remain further north, in the current 2009 field season a 4th-century CE shipwreck carrying N. African amphoras has been discovered just south of Porto Palermo. The opportunity to initiate a survey of the Montenegrin coast in 2009 was especially gratifying in that it expanded the exploration of this ancient and historically rich coast. Although ongoing, the inaugural field season of the Montenegrin Coastal Survey Project has already produced interesting results as work progresses from Boka Katorska to the coastline at the northern border with Croatia. The project was conducted in conjunction with Regional De-Mining Center headed by Mr. Veselin Mijajlovic and the Center for the Protection of Cultural Heritage, under the Ministry of Culture and Tourism. Examination of earlier finds along with new discoveries indicates great promise for the project. Evidence of Corinthian as well as early Italic and Roman trade are noted in finds from Boka Katorska displayed in the local Kotor Maritime Museum. These Corinthian wares date to the 4th century BCE, the final period of a forceful Greek presence in this quarter. Two shipwrecks on the outer coast discovered during the project’s current operations include a late-Republican wine carrier and a large tile carrier probably of Imperial date. The Roman merchantman transporting wine came to rest over 2 km from shore. All of the observable amphoras, representing at least two stacked layers, are consistently Lamboglia 2 type amphoras produced along the eastern Italian coast between the 2nd and 1st centuries BCE. Although some of the amphoras appear displaced from dragnets, most remain in their relative position to one another that suggests they settled based on their stacking pattern. The mound height and exposed tops indicate more layers of amphoras lay buried. The other, nearby wrecksite did not have amphoras observed on its uppermost remaining layers. Rather, both pan and cover tiles comprise a large shipment on what must have been a vessel of significant dimensions. These tiles are in several stacks, many of which are now positioned vertically. The pan tile’s c. 65 x 45-cm dimensions and flanges at an angle of 90o are characteristic of Roman manufacture during the Imperial era. Remains of Roman occupation in Kotor and Risan are evident; in particular the recently preserved mosaics in Risan, occupied by the Romans in 165 BCE, that are within the remains of a 2nd-century CE villa. Moreover, this section of coast witnessed substantial Roman colonization efforts. An Illyrian heritage is not lost on the coastal inhabitants of Albania and Montenegro, and in at least a broad sense, provides a degree of common history. Their shared story remains as one of the few links that bind the peoples of the eastern Adriatic. As with all RPM Nautical Foundation projects a primary goal is to assist host countries with the location, identification, and archaeological study of submerged cultural resources along their coasts. Current efforts on seas once associated with Illyrian piracy and plunder aims to prevent the modern plunder of these submerged cultural resources. Wrecksite with a cargo of Lamboglia 2 amphoras in Montenegro. Photograph courtesy of RPMNF. Amphoras at the Kotor Maritime Museum; a, c, and d – Corinthian type B amphoras; b – Lamboglia 2 type amphora. Photograph by J. Royal.